Magic: The Gathering - Puzzle Quest (Free) by D3PA is a new and innovative way to play your favorite strategy-based trading card game. If you love the original match-three RPG action of Puzzle Quest but wish that it took place in the MtG Multiverse, then this is one game that is worthy of a spot in your collection. Ever since high school, I’ve been interested in Magic: The Gathering and other collectible card games. There was always something I loved about collecting the cards, building a bunch of different decks that required different strategies and tactics, and just playing with friends. I tried getting into the competitive scene as well, but didn’t fare well against other, more experienced players. Still, I loved the game and continued to collect and play it on and off throughout the years. Another love of mine are the match-three RPG games ever since I discovered the original Puzzle Quest, so naturally, when I heard that Magic and Puzzle Quest were going to be combined into a single game, I was eager to get my hands on it. If you have experience in either the original Puzzle Quest or MtG, then you will feel right at home when you see the graphics in the game. 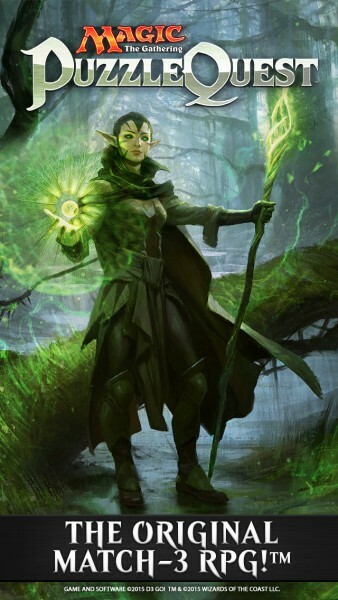 There is incredibly detailed artwork from the Magic universe, including the different lands, planeswalkers, and creatures. Since MtGPQ is starting with the Origins expansion, you will see familiar art if you’ve been up-to-date with the card game. Even if you are completely new to the Magic: The Gathering universe, you’ll still be in awe of the gorgeous artwork. 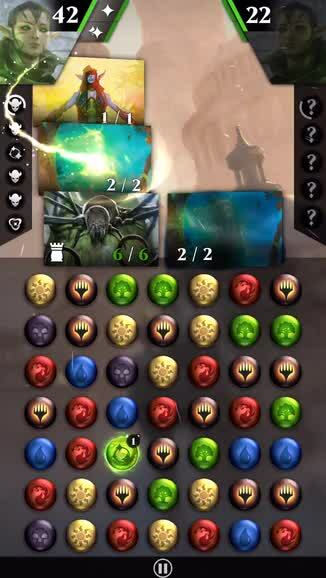 As far as the stages themselves, the gems on each grid are bright and vibrant, with easily identifiable icons for each mana type as well as Planeswalker loyalty points. The soundtrack in the game is just as you’d expect from a match-three RPG that takes place in the fantasy world of Magic, and the sound effects are a nice, overall touch. In MtGPQ, there are two ways to play: Story and Quick Battle. 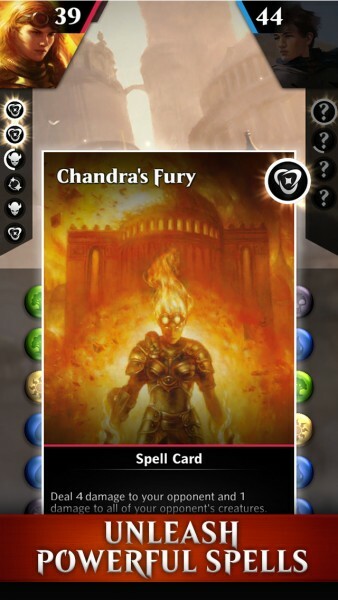 Story is the standard campaign that you’d expect from a Puzzle Quest title, where you go through levels one-by-one and meet objectives for extra rewards, which include the Planeswalker tokens and crystals. For Quick Battle, it will pit you against other real players for a quick PvP match. As you win or lose these battles, your leaderboard ranking will reflect your performance, so this is definitely the way to go if you want to test your skills against other players. But no matter which way you choose to play, the objective is the same: reduce your opponent’s life points to zero before they do the same to you. What I love about MtGPQ is the fact that it combines the best of both worlds. You still choose the Planeswalker you want to play as, collect cards from booster packs and craft your deck to use against foes. Each card will have a certain mana cost to play, though, and you gain mana by making matches of gems on the board. 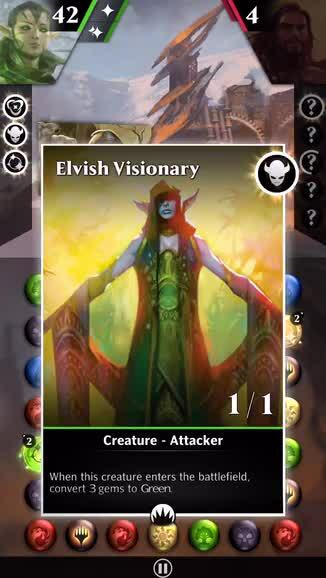 Each Planeswalker also has their own unique abilities that can be used with enough loyalty points (match the Planeswalker gems to fill this up quickly), and they also have synergy with certain colors on the board. For example, while you can make matches of any color, some will fill up your mana slower than the others if they are of opposite energies (for example, black makes one less mana for Nissa). Each player will take turns matching gems to gain mana and cast their creature, spell, and support cards during battle. 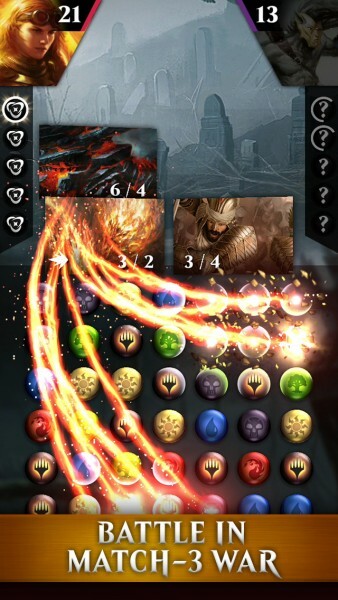 On each turn, a card is drawn, and you can always view your hand by swiping from the left edge. 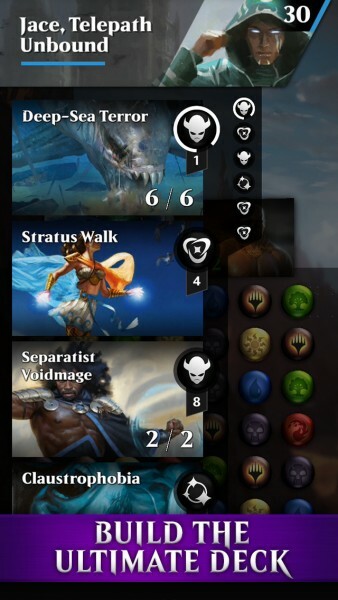 Rearranging the cards priority can be done by drag-and-drop (the card on the top will get priority with mana), and just tap on your Planeswalker’s portrait to view their loyalty abilities and use them if you have enough points to do so. After you make a match, your summoned creatures will attack the other player, unless there is a special effect such as defender or berserker, where they may have to attack an opposing creature or even take damage. This is where the power and toughness numbers come into play, and all creatures have summoning sickness when cast (can’t attack that same turn) unless they have Haste. You can also only have three creatures out at once, which is a limitation that is imposed in this game only (you can have as many creatures as you want in regular MtG games), so make sure to choose wisely when prompted to replace one. 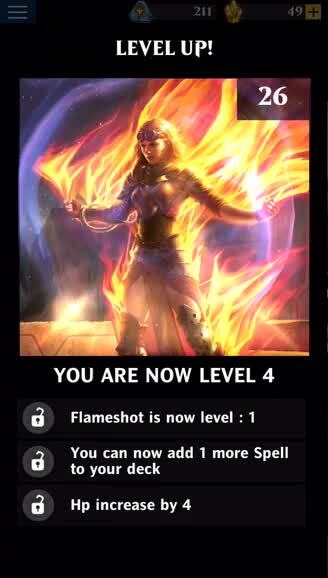 Since this is an RPG as well, you’ll have to level up your Planeswalkers as you go with the token currency that you earn from each battle or as extra rewards for completing objectives. 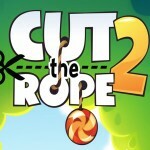 As they get stronger, it will cost more to level them up, so there is a bit of grinding that is involved with the game. 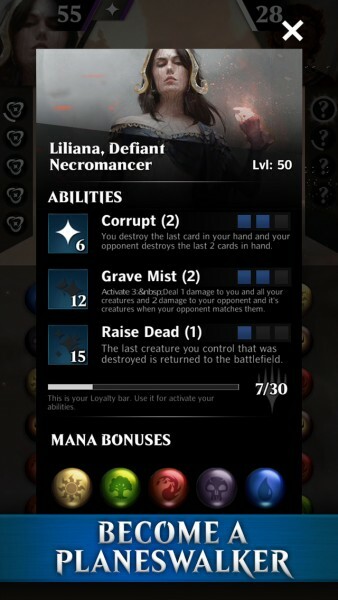 While you start out with only Nissa, Sage Animist in the beginning, you can purchase the other Planeswalkers (Gideon Battle-Forged, Jace Telepath Unbound, Liliana Defiant Necromancer, and Chandra Roaring Flame) in the Vault with the premium crystal currency. More boosters can also be bought with the crystals, in case you want to improve your decks. Each Planeswalker has a color associated with it, and can only use cards of that color, though matches can be of any mana color. After each battle, your Planeswalker may need to regenerate their health points. Depending on level, this can take a few minutes or longer, so you can either take a break or try out another Planeswalker deck in the meantime. If you’re impatient, you can just choose to heal them fully for a cost. As a big fan of both Magic: The Gathering and Puzzle Quest, I’m enjoying MtGPQ a lot. I’ve only downloaded the game last night, but I’m finding it rather hard to put down. The visuals are stunning and it is great to see all of the Planeswalkers from Origins in action here. The computer opponents are fairly smart, so outwitting them can be a challenge and victories are a rewarding feeling. 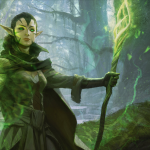 Replay value is also high in the game, since the objectives can be a test in themselves and you’ll have to tinker around with various Planeswalkers and decks to find the best strategy for accomplishing them. The only thing I didn’t like is the fact that you need to sign in with Facebook, so hopefully this can be changed in the future. I recommend giving Magic: The Gathering – Puzzle Quest a try if you are a fan of match-three RPGs and fantasy card games. 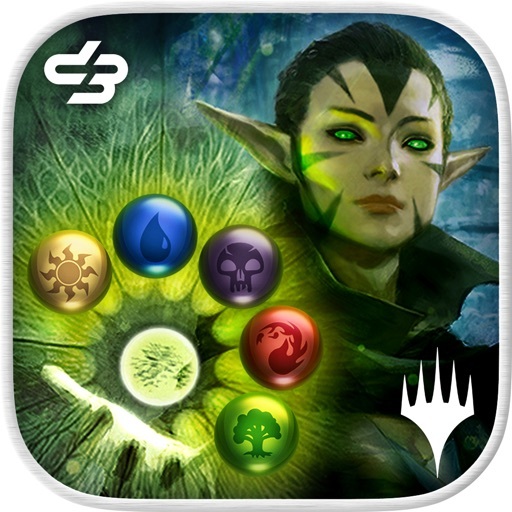 Magic: The Gathering – Puzzle Quest is on the App Store as a free download for your iPhone and iPad with optional in-app purchases.